and Tamba Wine Factory which produces Tamba Wine. Here is our report about the Tamba Wine Factory. When we came into there, a woman appeared and said, "Please help yourself to do a tour of factory." What? Nobody guide us around the factory? We started a tour of factory with further anxiety. 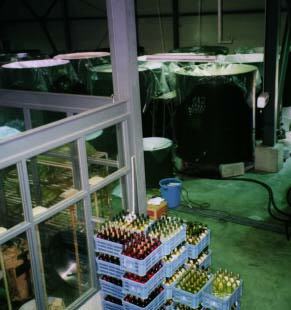 This factory was built in 1986 and constructed of storehouse and a line of automatic bottling. In spite of being small, it is capable of bottling 10,000 bottles of wine a day. Great!! The number of employees are six or seven and they mainly checked the quality of goods. To our surprise, there are a man who still sat in front of the line of flowing bottles. We wondered what he was doing? After the while, we found that the man was checking whether a foreignsubstance was in the bottle. Did he have a time to go to a toilet? Finishing the tour, we turned the way to a stall to test the taste of wine. Testing the taste of wine was held in the small stall aside the factory. The woman whom we met in the office took charge of our testing. We didn't know well about wine and distinguish the difference of taste of wine, but we became to distinguish it while we continued to drink several types. Though there is no accounting for tastes, there was only one that we chose the best taste wine. The name of it was Semiyon. 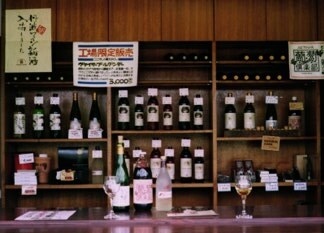 The wine costs 4,000 yen and was most expensive of all the factory produced. It is very delicious and easy to drink. We all drank it too much. Thank the woman in charge of testing wine. After all, we finished testing the taste of all kinds of wine and became tipsy. If you want to visit Tamba Wine Factory, you should in advance make a reservation by phone in advance. The tour is free. You'll surely find out that Tamba Wine is carefully made by all employees. The woman told us that many kinds of grapes were cultivated in vineyard and the grapes for wine have little taste. We also knew some knowledge about making wine: White wine is made removing the peel of grapes, Red wine is made remaining them and Rose wine is made removing them in the middle of the process. The stall aside the factory has some wine which you cannot buy only there. You may test the taste of any wine at the stall. Some souvenir are sold at the shop, where one of us bought a wine-opener. Of course, you can buy there all wine Tamba Wine Factory produces. Why don't you invite the Tamba Wine Factory if you're interested in wine.